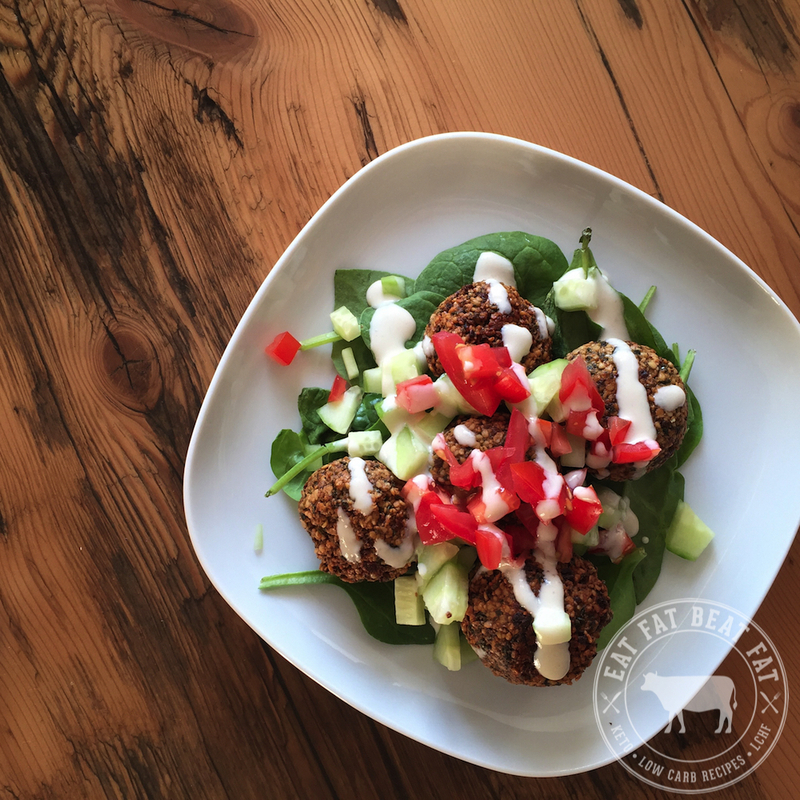 I don't know about you guys, but I absolutely love falafel! This vegetarian dish from the Mediterranean and Middle East is one of my favourites - but with chick peas being the main ingredient, they are a keto killer, coming in at a whopping 50g net carbs per 100g! #nothanks. Now, I wasn't about to let my falafel fondness fade without a fight. After some experimentation in the kitchen, I'm thrilled to present the Ultimate Keto Falafel - an @eatfatbeatfat original. Note: This recipe yields approximately 5 falafel. This recipe works best in a food processor, but if you're old school, go ahead and chop to your hearts content. First thing you should do is take the flax meal and mix with water, you want to give it some time to combine to an egg-like, gelatinous consistency. In the meantime, load up the food processor with the remainder of the ingredients, once the flax has combined, add that into the mix. Pulse the food processor to start, and then process until the ingredients are finely chopped and uniform. At this point, the mixture should be wet enough to form into balls of falafel - I usually use a tbsp measuring spoon as my form for the falafel. Once all your falafel are formed, get some oil up to frying temp and drop these puppies in, 3-5 minutes per side should get the outside nice and crispy, but keep an eye out so they don't burn. Remove from oil and let them set-up and drain on some paper towel. Boom! There you have it, keto falafel. High in protein, omegas, and best of all low-carb. My go-to way to serve these is over a bed of lettuce, garnished with tomato and cucumbers, and a generous drizzle of tahini. Enjoy!